Our ATA Battle Mode Console features 90 degree turntable wells (sideways - a.k.a. battle mode). 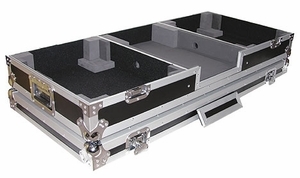 This case features fully padded turntable wells and recessed hardware. Holds two 1200 style turntables in Battle position, and one 12" mixer. Includes wheels for easy transport. Width Height Depth 49" 9" 22.5"